On Easter last year we came home from a weekend away and there was an Easter basket sitting on our counter with one egg in it. I opened the egg and inside was a piece of paper with a reason Jeff loves me on it, also giving me a clue for the next egg. The first egg said “I love waking up to the most beautiful girls every morning” (meaning our dog, Lola, and I) and the next egg was under the pillow. You get the idea. The last clue led me to Lola’s collar which had the ring in it. At this point I was shaking so badly Jeff had to open the egg. He then got down on one knee and proposed. How did you know your dress was the “one”? When I first went dress shopping I thought I would end up picking something fitting. I went with five women who all thought that was the style I should pick because I have a small build. After I started trying on all different styles I realized I wanted a ball gown. I felt like a princess in them and knew I would never have a chance to pull off that style of dress again. The only problem was I didn’t want one that felt too big. I went to four different dress shops and luckily noticed the Mikaella 1865 dress at the last stop. I loved the two different fabrics used and how the skirt on the dress elegantly flowed down instead of popping out. I also loved the plunging back and all of the layers in the skirt. What was one of your favourite wedding day details? The ceremony – String lighting, a chandelier above us, rose petals scattered on the floor, an arbor covered in flowers behind us and a table with pictures of our loved ones that are no longer with us covered in tea light candles and flowers right next to us. 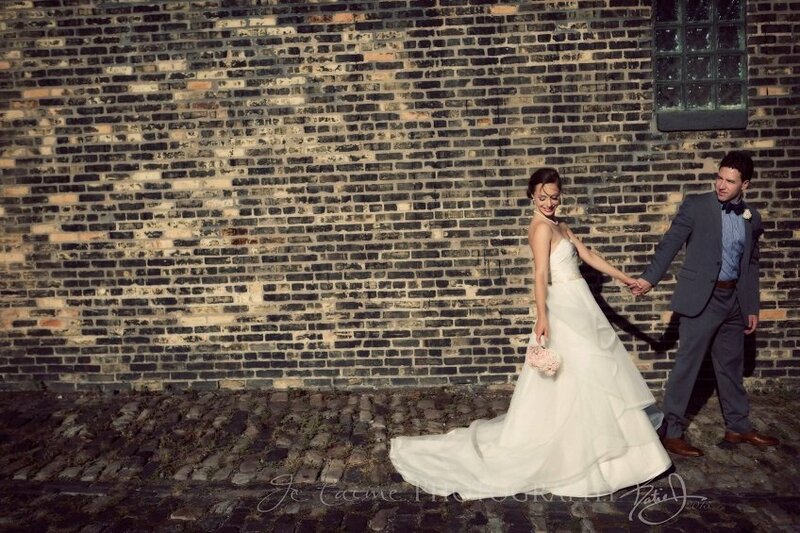 Thank you, Sararose, for sharing your wedding with us! If you’re a Mikaella Bride, we’d love to hear your story! You can also find more of our Real Bride stories in our Real Brides Gallery, including the one Sararose sent us. To stay up to date with news from Mikaella Bridal, like us on Facebook and follow us on Twitter, Instagram, and Pinterest.